Type: SOFTWARE. Detail: FT OPENING. Product Code: CBFT-ZMMBEDVD. 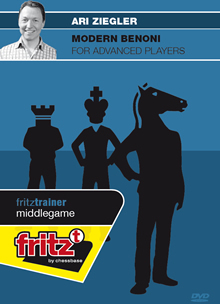 The Modern Benoni is perhaps the most dynamic approach to meeting 1.d4 without sacrificing a pawn. A lot of legendary players have had a sincere love affair with this opening. The most imaginative world champion of all time, Michail Tal is perhaps the player who has done most to popularise the opening. In this DVD International Master Ari Ziegler is giving you a fighting repertoire against all White systems in the Modern Benoni. The target audience is club players with Elo 1500 to 2400. Thanks to Zieglers research you will find many surprisingly simple solutions in some lines, while in the critical lines which are being debated he gives new moves or reevaluates underrated systems. With this DVD to back up your repertoire in the Benoni you will combat White from the beginning with counterblows, strikes, positional traps or deep strategic plans, all that is necessary to hunt White down! Video running time: 4 hours 57 min.